I’ve been getting a lot of my kitchen inspiration from Tasty lately, probably because they’re constantly showing up on my Facebook dash. In an effort to widen my online cooking exposure, I subscribed to a few other feeds today; if anybody has any in particular that they’d recommend, do drop me a line! Anyway, the one that I tried over the weekend was Easy Homemade Gnocci. I have to say, this dish was anything but easy. It was disaster after disaster, really. I don’t know how much of that was the fault of the recipe and how much of it was my own, but nothing seemed to go right. First of all, I prepared the potatoes exactly the same way as the video showed, but my mashed potatoes ended up being a gluey mess. They were either too moist to start or I should have prepared them differently; they definitely weren’t overcooked, since the center of the larger ones were still a little raw (I discarded those pieces). After perusing the video comments, I learned that some people bake their potatoes instead of boiling them to prevent excess moisture. Also, many people recommend a potato ricer instead of a masher, as it keeps the potatoes from turning gluey. As a bonus, if you cut the unpeeled potato in half and press it through the ricer, you don’t even have to peel anything — it kind of works like a giant garlic press or a modified of food mill. 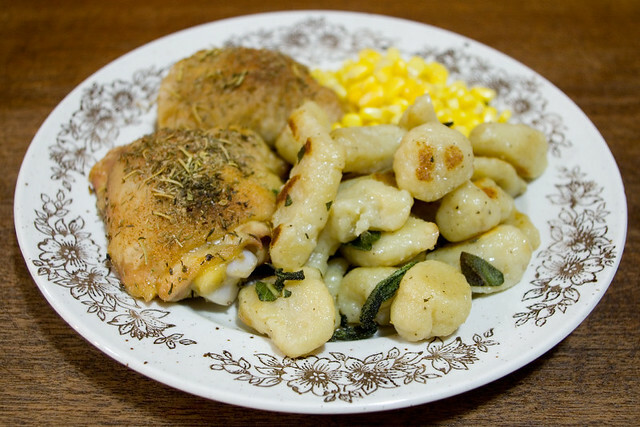 My homemade gnocci served with baked herbed chicken thighs and corn. I’m pretty sure that the potatoes were too moist, but I think they were also too large. The recipe calls for 3 to 4 small or medium russet potatoes, but that’s very subjective. Since vegetables can come in all different sizes, I much prefer a measurement by weight or at least by volume, as I’ve talked about before. Due to the moisture, I had to use twice as much flour as the recipe calls for just to get the dough even close to firm enough — and I think I really could have used more. I’d read online that too much flour can make the gnocci heavy and stodgy, and I was trying to avoid that… I don’t think I succeeded. The gnocci that I made did not hold their shape for long after forming and were much too floppy for the fork method to work at all. I made the mistake of letting the noodles touch before boiling them and they just congealed back into a large mass of dough, so I had to form them again. The dough was so stretchy that they didn’t keep their shape in the water. In the end, I liked the flavour of the gnocci fried up in butter and sage, even if the pasta was misshapen and stodgy. I think I’d like to try this recipe again with modifications until I get it right. For that reason, I don’t think that this recipe is an easy beginner dish — I think that the original article misrepresented it as such. But it could eventually be quite nice, with practice. Perhaps I can find an Italian nonna who is willing to teach me the finer points of this dish, if only to keep me from massacring a tradition so badly next time. Posted on January 9, 2018 January 9, 2018 by owntwohandsblogPosted in CookingTagged beginner, dinner, easy, fail, food, homemade, italian, pasta, supper, tasty.